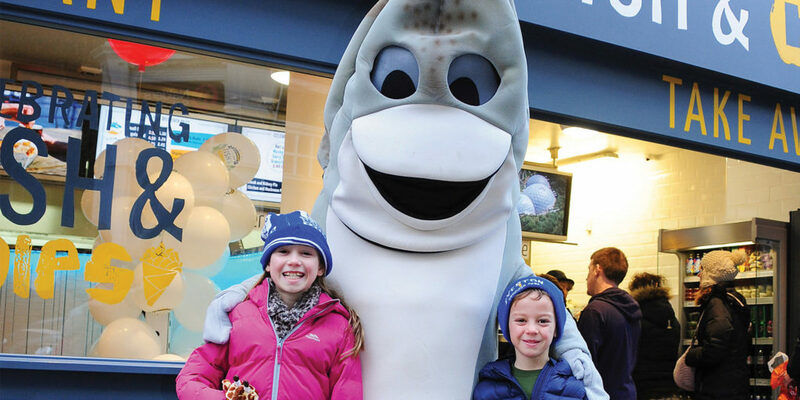 We discover that award-winning fish and chip shop, Harbour Lights in Falmouth, is leading the way when it comes to taste and tradition. You’ll find Harbour Lights perched above the historic Custom House Quay in Falmouth. 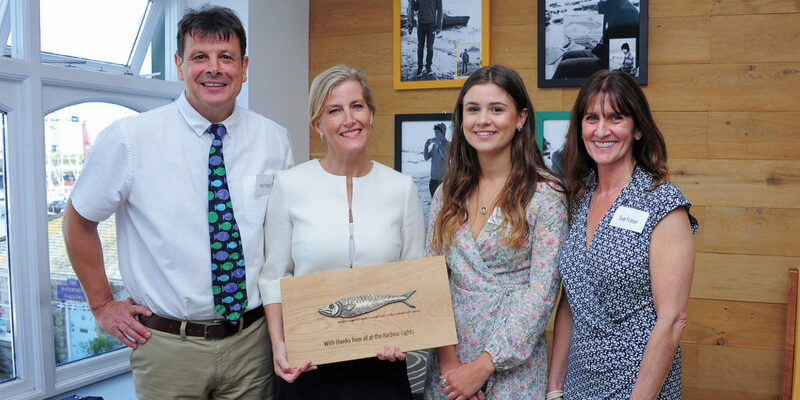 Recently shortlisted in the Top Ten for the coveted ‘Best Fish & Chip Shops in the UK 2019’ award, which adds to an already great haul of accolades, we were intrigued as to what makes an award-winning chippie. 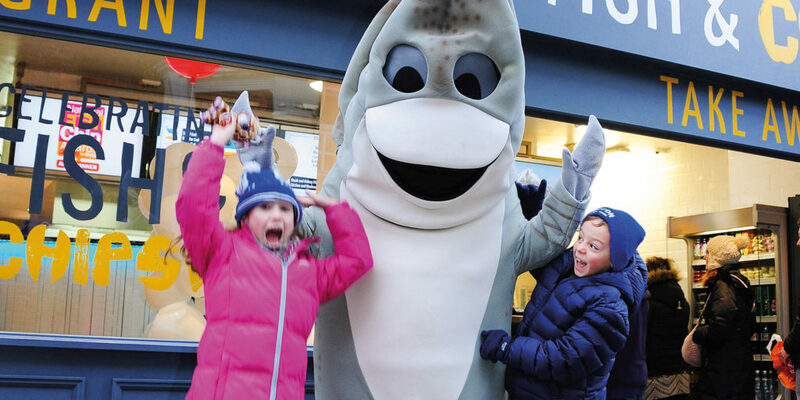 A fish and chip shop is judged on having flaky moist fish, light crispy batter and moreish chips and it’s clear that Harbour Lights hits the jackpot with all three. Their fish is a combination of responsibly sourced Cod & Haddock, and local fish delivered daily from local fish merchant Stevens & Sons. Potatoes are a passion for Harbour Lights, with their Cornish spuds arriving from farms within just a 20-mile radius. Double-cooked to perfection, these are as good on their own as they are when served with a succulent piece of fish coated in a specially formulated batter. Add to that a side of delicious homemade mushy peas and you’ll see why Harbour Lights is leading the way when it comes to fish and chips. 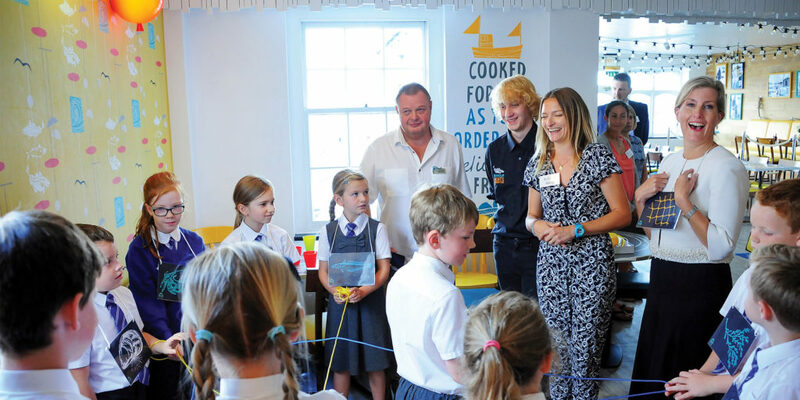 However, it’s not just the food that makes a chippie award winning. The team at Harbour Lights is fanatical about every portion being as good as the last, and they do this with passion and fun. Their motto ‘Celebrating Fish and Chips’ is evident the moment you walk through the door – it’s almost as if fish and chips is in their DNA. 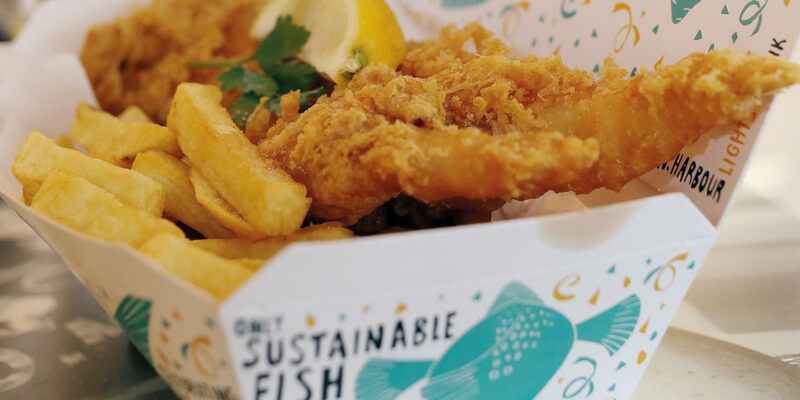 Despite a foodie revolution across the UK, fish and chips has never gone out of fashion and this great British fare is hard to beat when you fancy some comfort food. Harbour Lights have stayed true to the nation’s favourite using fresh, quality ingredients, cooked simply but well. 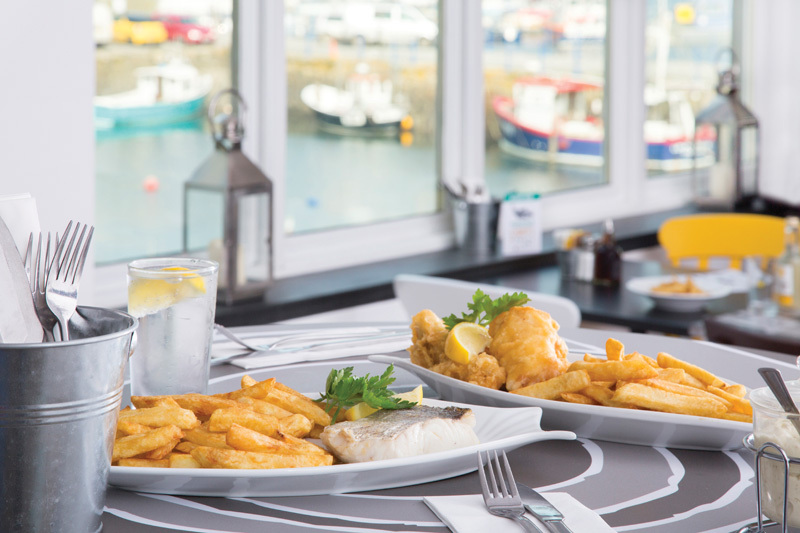 Whether you are a traditionalist and don’t like to stray from cod or haddock, or are more adventurous and want to sample some of the Cornish local fish fresh from Newlyn, battered or grilled, the choice is yours. 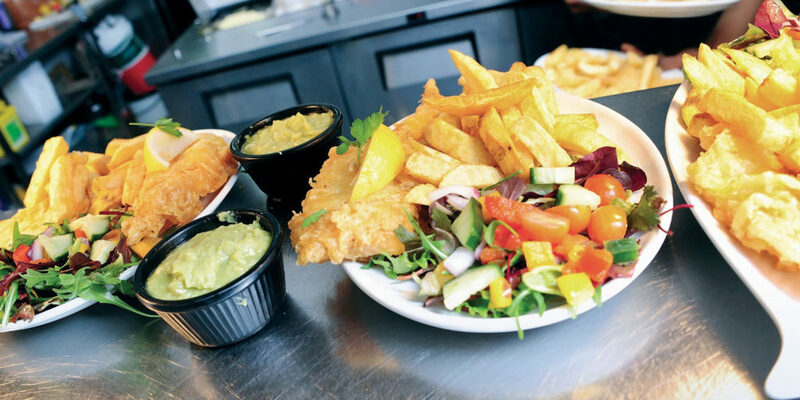 To ensure everyone can enjoy their award-winning fish and chips, the Harbour Lights team cooks with vegetable oil, offers gluten free options and now even vegan fish and chips! Their homemade mushy peas and curry sauce are perfect for chip dipping too! 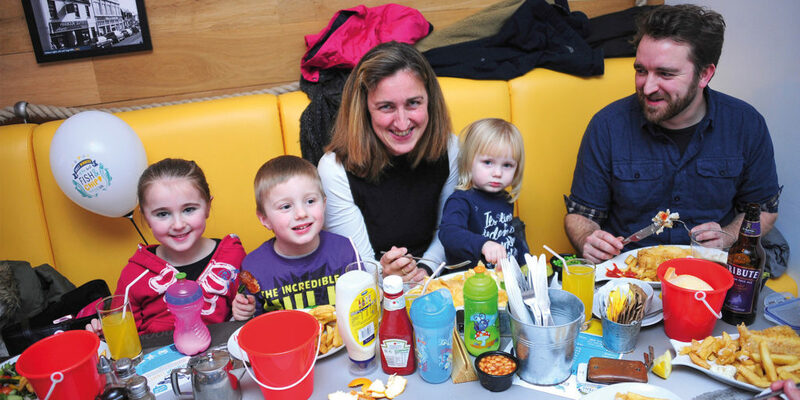 With over 180,000 happy customers visiting every year a trip to Harbour Lights should be on everyone’s menu! "flaky moist fish, light crispy batter and moreish chips"
All served with unlimited freshly fried chips, a wedge of lemon and tartare sauce. Prized MSC Cod caught to be enjoyed on the hungriest of occasions. This timeless and classic combination of the ultimate comfort food ricks all the boxes. Served with award winning chips, homemade mushy peas, bread & butter and unlimited tea. Burgers are served on a brioche bun with your choice of salad or chips and sauces. All come with your choice of chips, salad or half and half. A selection on sides and a children's menu are also available.